Having been with us for almost six years, the electric Tesla Model S has quickly shifted from rare, exotic spaceship of the future to a common sight on British roads – especially in and around London where chargers are plentiful and the £64,700-to-£133,500 price tag is somehow more palatable. But what happens if you want to stretch the Tesla’s legs a bit? The company claims its Model S 100D has a range of over 390 miles and that, paired with an ever-expanding network of its Supercharger charging stations, makes it suitable to go anywhere. Interior of a spaceship – but where are the toys? First, a quick introduction to the car. The Model S is Tesla’s best-seller, closely followed by the newer Model X. Both cars sit on the same chassis and offer near-identical performance, technology and driving features – however, the S is a saloon car roughly the size of a BMW 5-Series or Jaguar XF, while the Model X is a high-riding SUV larger than a Range Rover. Both models are wide and take some getting used to on narrow London streets, but being automatic and having just one gear makes any Tesla remarkably easy to drive. Step inside the 100D and you are greeted by a massive 17-inch touchscreen. It dominates the dashboard and provides access to the sat-nav, media, climate control, Bluetooth-connected phone, electricity usage charts, the reversing camera and a web browser. The screen is bright, sharp and faster than anything else on the market, but tricky to interact with while driving. Even tapping to adjust the cabin temperature or turn the heated seats on (controls which remain at the foot of the screen at all times) takes your attention away for a beat longer than other cars’ physical controls. Some settings can be adjusted with buttons and scrollers on the steering wheel, however, just not everything. Behind the wheel is a second screen with widgets for speed, media, sat-nav, phone and electricity usage. 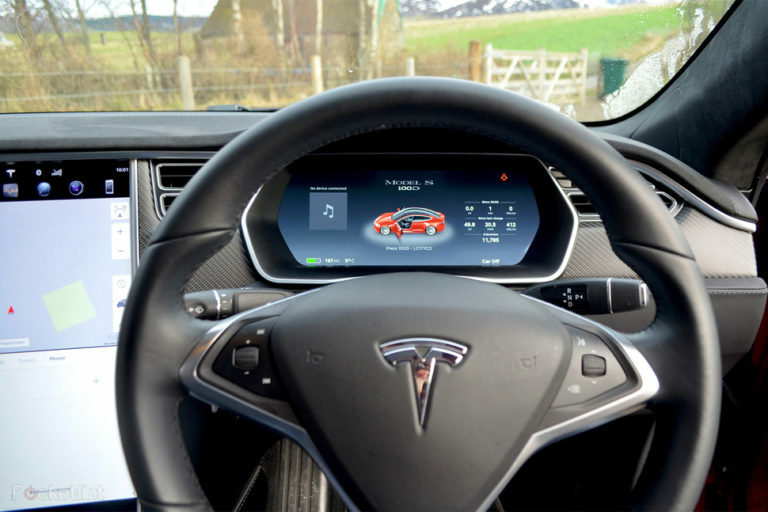 The interface for Autopilot – which is Tesla’s increasingly well-known automated driving feature – is also found here, but our test car was not fitted with this £4,700 assisted-driving system. Some aspects of the interior are less high-tech. The centre console and storage unit feel cheap, the doors have no storage bins, there are no passenger grab handles above the windows, and the bench-like rear seats lack the comfort you’d expect from a £100,000 super saloon. Indeed, the Tesla lacks many of the toys and luxury you’d expect in a similarly priced Audi, BMW, Jaguar or Mercedes. There is no head-up display (HUD), no massage seats, no TV screens or reclining seats for rear passengers, and the optional Lightning port doesn’t sync a connected iPhone to the car. Of course, with a Tesla you pay your money for the technology which lies beneath. This 100D’s name refers to the 100 kilowatt-hour battery and D means – as with all new Tesla cars – it’s all-wheel-drive. Despite weighing a little over two tonnes, it can accelerate from zero to 60mph in 4.1 seconds and has a top speed of 155mph. The faster P100D (P for performance) has the same battery and all-wheel-drive system, but boasts Tesla’s now famous Ludicrous mode, which delivers 60mph in an outrageous 2.5 seconds and achieves the same 155mph V-max. Needless to say, both are supremely fast and deliver their performance with the relentless shove only an electric car can muster thanks to higher torque than a combustion engine-based car. 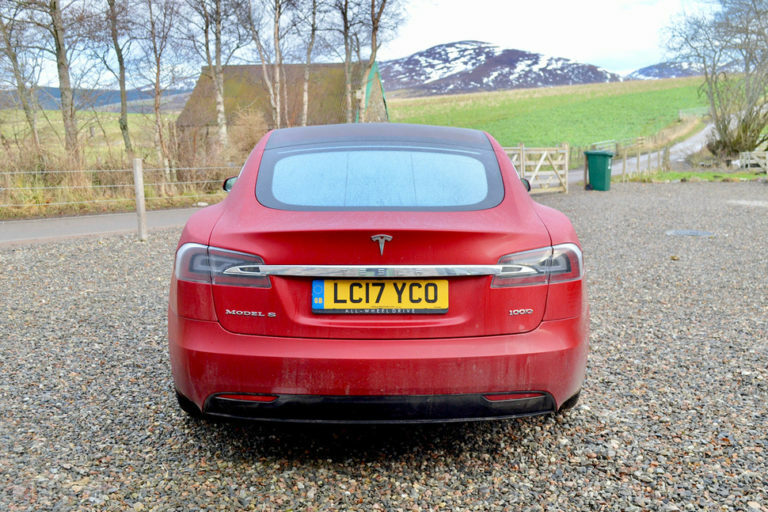 But reaching the Aviemore Supercharger is an endurance, not a sprint. We knew we’d have to leave our lead right foot at home if we were to complete the London to Scotland journey without an embarrassing call to the AA and Tesla’s press department. Driving a Tesla – indeed, driving any electric car – brings with it a hearty dose of range anxiety. 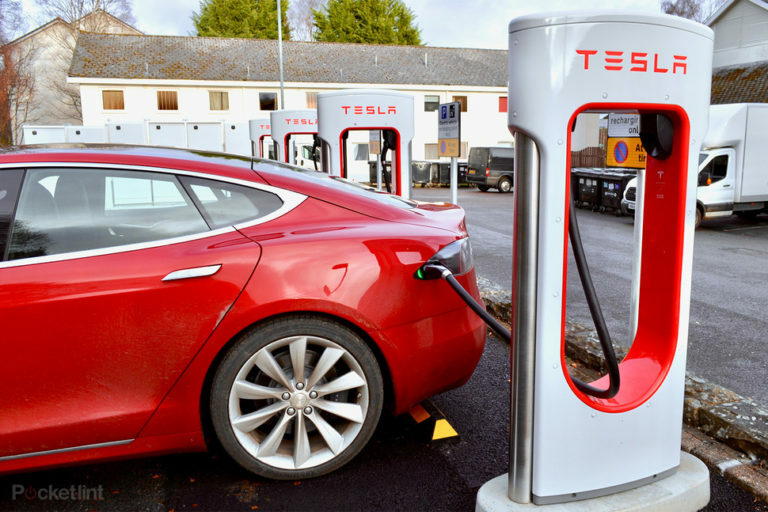 Petrol stations litter the country from John O’Groats to Land’s End, but Tesla Superchargers are strategically scattered to help you complete long drives. Such stations are not intended for everyday charging, because Tesla would rather you install one of its £460 home chargers and use your own electricity. At-home charging tops-up the battery with roughly 50 miles of range per hour, which is enough to refill overnight and costs comfortably less than a tank of fuel. Plug into a Supercharger, however, and the battery is filled at over 350 miles-per-hour, which in most situations means the car is ready to go again when you’ve finished your coffee. Add this to the car’s knowledge of where every Supercharger is, and driving a long way is often a case of punching in the postcode and doing as you’re told. The sat-nav not only tells you where to stop, but how long to recharge for at each Supercharger. Link the car to Tesla’s smartphoneapp and you’ll be notified when the battery is full enough to reach your destination, or the next Supercharger. This all sounds good in theory, but you quickly learn that the 393-mile range quoted by Tesla – based on the New European Driving Cycles (NEDC) standard – is not applicable to steady motorway driving. Even when sticking to the 70mph speed limit with cruise control activated you realise that official figure cannot be trusted. It’s a useful way of comparing the 100D with other electric vehicles – just as mpg is when buying a petrol or diesel car – but that’s about it. The weather also plays a factor in driving long distances on electricity. Cold temperatures reduce battery efficiency, while heavy rain and a sodden road will increase friction and hamper progress further still. Added to this, charging the last few percent of a Tesla battery takes a long time compared to the first 80 per cent or so, just as it does in any rechargeable battery device, like a smartphone. We never actually filled our Model S to 100 per cent battery on the entire trip, but would estimate that, in a British December, the 100D is more likely to get 290 miles from a full charge, not the quoted 393. This is still exceptional for an electric car, but something to keep in mind nonetheless. Before setting off toward our Scottish target, we made a note of where every Supercharger location, and on which side of the carriageway, as service stations don’t all offer access from both directions. We also checked on the location of fast public chargers, packed every type of cable adapter and even a household extension cable for emergencies. Was this level of planning really necessary? The answer – even when driving a borrowed car on an unfamiliar route with a passenger who didn’t want to ride in a recovery truck – is a no, but that’s only confident with practice. The Model S has several ways of showing how much charge is left. There is a hugely optimistic miles-remaining figure next to the speedometer, an app on the dashboard touchscreen showing graphs, real-time telemetry and often a terrifyingly cautious estimate of what’s left, and an estimate of charge remaining at your destination. The first ticks down far more quickly than the miles are racked up, so when it says you have 250 miles left it’s probably more like 150; the second adjusts with every press of the pedal, so is hard to judge, but we found the third and final figure to be spot-on. On our 1,200 mile journey the percentage-remaining-at-next-stop stat remained spookily accurate the entire time. We quickly found a glance at this is all you need to get an overview on how much energy is being used, and how likely you are to need a recovery truck. If that figure falls dangerously low (five per cent, say), then backing off a little will see it rise again over the next couple of miles. Essentially, by driving to adjust this figure you are controlling your own range anxiety. That being said, on the entire trip we never felt the need to slow down to HGV pace for fear of running out of juice. We also didn’t use any of the UK’s thousands of public car chargers, but scrounged some electricity at an overnight stop (thanks, Mum). 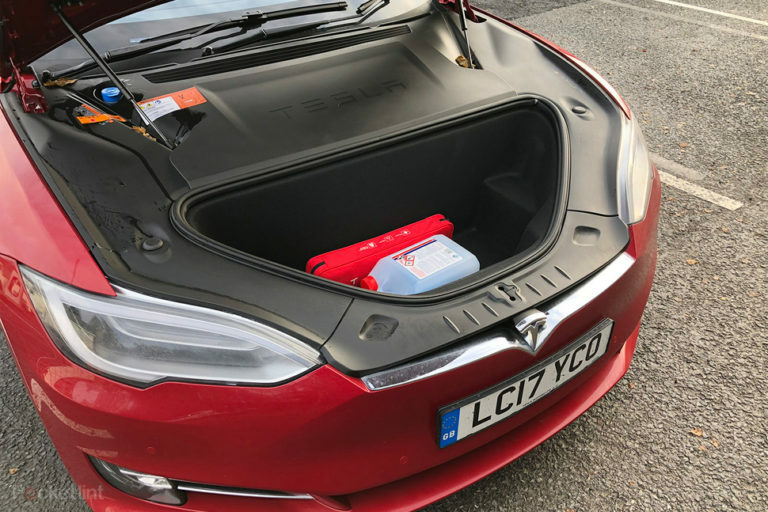 Feeding an extension cable through the letterbox might seem undignified, but we slept more soundly knowing we’d wake up with 80 miles of range to reach the next Supercharger instead of 30. We made an extra stop heading north, at the Gretna Green Supercharger just beyond the Scottish border, for an anxiety-busting top-up, but with another charger at Abington 45 minutes away we could have done without. In truth, we’re still kicking ourselves for this as it wasn’t necessary – we knew it, and the car knew it too – but when the option to charge presents itself, even for just five minutes, it’s hard to say no. On the return journey back to London our confidence in the Tesla grew. We switched motorways to avoid traffic and ignored the car’s guidance for an hour or so, knowing we’d make it back to London with enough charge in reserve. Like anything, this confidence in your own judgement comes with practice. We could have followed the car’s instructions every step of the way, but with 1,000 miles racked up we’d developed a good feel for what would work and what wouldn’t – just as we all do with the fuel dial in a regular car. So that’s settled, then. 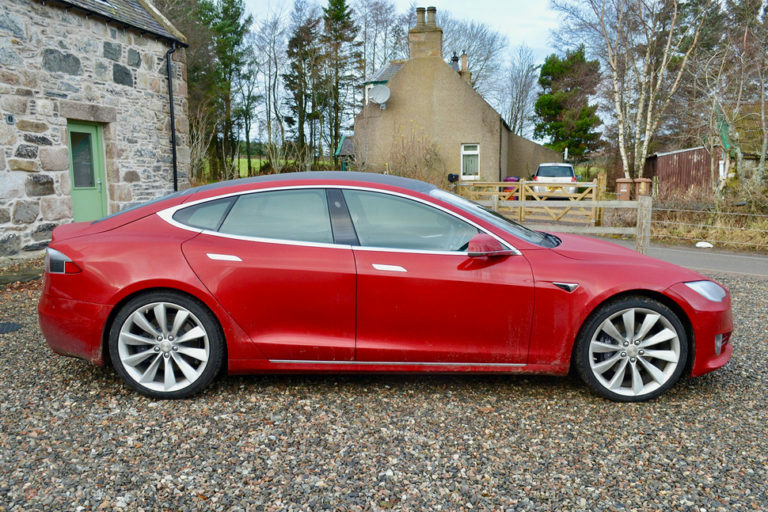 You can drive a Tesla on a 1,200-mile Scottish road trip without worrying. The sat-nav and the Supercharger network are all you need, there are plenty of public charger safety nets if something goes horribly wrong, and at no point did charging feel like a bore. We mostly charged for between 20 and 40 minutes at a time, often coinciding with stops for food and to stretch our legs, and never felt like we were having to slow or adjusting our driving to preserve energy. But how does the Model S stack up as a £100,000 luxury saloon? The ride is good, as should be expected for six figures, and the lack of engine makes it beautifully quiet. The steering has three options and there’s some hefty (albeit artificial) weight to it in sport mode, while the brakes are strong but lacking in feel, while the accelerator’s sensitivity is excellently judged for such a powerful car. As with other electric cars, lifting off the accelerator causes the Tesla to slow much more than a regular car. Called regenerative braking, this is the effect of the motor being used to slow the car, harvesting energy back into the battery and eking out a little more range. The system takes some getting used to, but once you learn to lift the accelerator a little to slow gently and a lot to slow more sharply, you’ve cracked it. The brake pedal is only really needed when coming to a complete stop. Thanks to the compact motors being much smaller than an engine, and the battery being in the floor, the Model S has two boots. Of the 894 litres of total space, 150 litres are under the front, where the engine would be. Six years on, driving a Tesla still feels like living in the future. 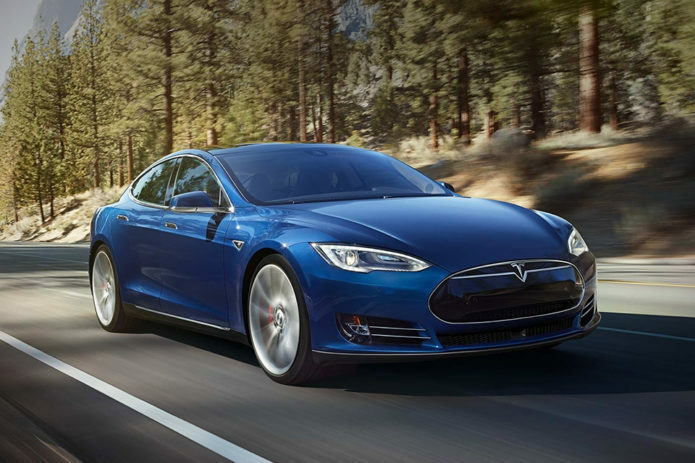 Other manufacturers have caught up on tech features like setting the climate with a smartphone app, but none can match the Model S’s monstrous straightline performance, market-leading range and Superfast charging network support. 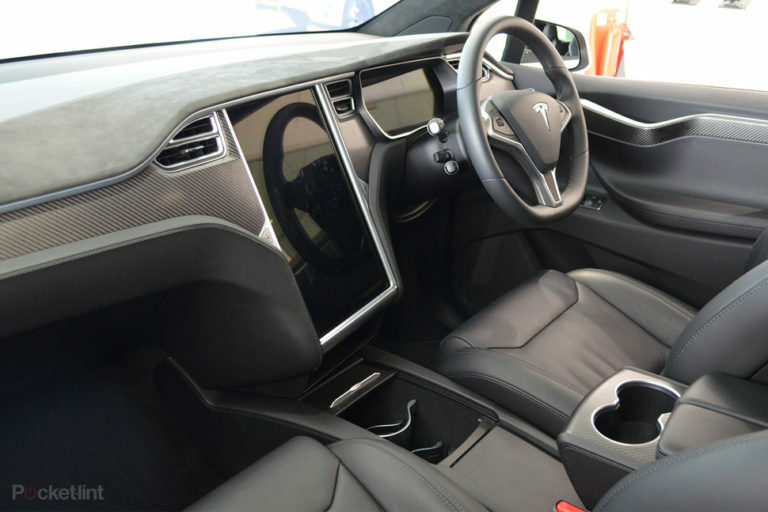 The interior is still where Tesla needs to seriously up its game, but everything else is hard to fault. What’s most impressive is actually how unremarkable the Tesla experience is. Yes, you have to stop more often than in a petrol or diesel car, but it was usually us who needed to stretch our legs before the car asked to be plugged in. Unless you’re in a massive rush, stopping for 20 minutes every two hours or so is little bother. The Model S is an outstanding technological achievement which will surely go down as a turning point in the history of the motorcar. It has its shortcomings, but you must remember this is Tesla’s first attempt at mass-production and, for now at least, it remains miles ahead of the competition.